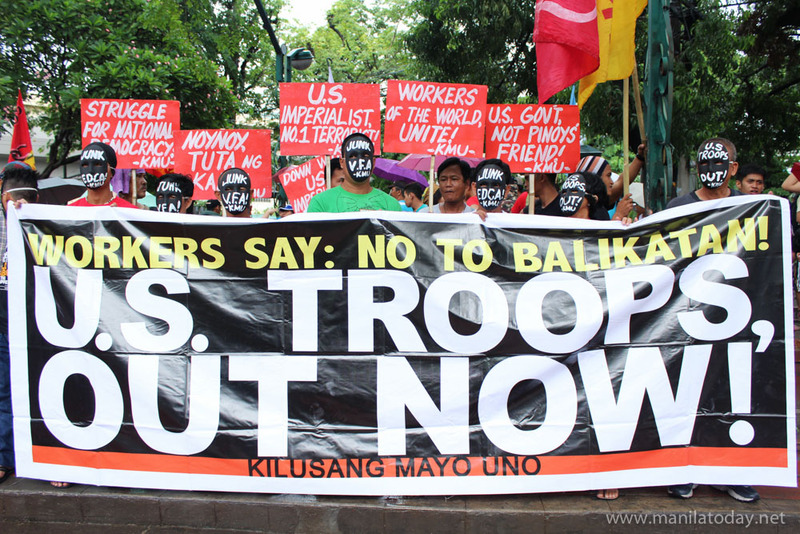 Progressive groups under the umbrella group Bagong Alyansang Makabayan (BAYAN) gathered at Plaza Salamanca in U.N. Avenue, Manila on Saturday, July 4, to condemn the long-standing unequal relationship between the US and the Philippines. July 4, the Independence Day of the United States of America (US), is marked as the Filipino-American Friendship day in the Philippines. But BAYAN and activists are wont to say that there is no real friendship between the US and the Philippines. Activists criticized the “unequal” and “lopsided” relations between the two countries, stating agreements such as the Visiting Forces Agreement (VFA) and Enhanced Defense Cooperation Agreement (EDCA), which help retain US military bases in the Philippines. “The US has never ceased to dictate and impose its interests on the Philippines, in the fields of economy, politics, foreign policy, military and culture,” BAYAN said in a statement. Groups also criticized the intrusion of US over the territorial dispute in the South China Sea. Bajo de Masinloc and other areas part of the exclusive economic zone of the Philippines in South China Sea have been occupied and built on by China. China claims almost the entire South China Sea, where a $5 trillion ship-borne passes every year. Other countries, such as Vietnam, Malaysia, Taiwan and Brunei, also have overlapping claims. The Philippine government through President Benigno Simeon Aquino III, a US ally, is seeking help from the US government in dealing with the South China Sea territorial dispute. The Philippine government justifies the presence of US soldiers, equipments and war vehicles in various areas in the country with this predicament. However, the US has to publicly take the side of the Philippines while it has pursued many business partnerships with China. Activists said the US is only using the issue of South China Sea to justify and maintain its status as a Pacific Power. The US has been building temporary and permanent bases in many Asian countries as well as reinforcing its presence in trade in the Asia Pacific as part of its pivot and rebalance to Asia. “The unequal, neo-colonial relations remain true to this day amid the power-play in the West Philippine Sea where the US is posturing as the savior of the Philippines versus China,” BAYAN said. Groups further called for the Filipino people to stand for Philippine sovereignty.